Posted on January 29, 2019 by Mike Sonnenberg Posted in Schools, small towns	. 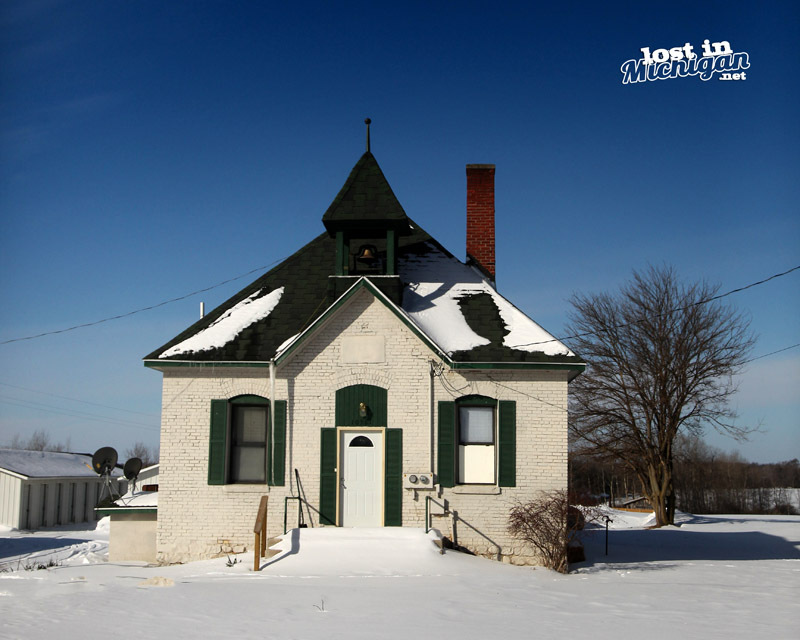 I saw this old schoolhouse in the community of Loomis east of Clare near U.S.-10. The town was originally named Buchtel with A station on the Pere Marquette railroad and post office. The name changed in 1871 when Erastus G. Loomis, George W. Wise and E. F. Gould built a sawmill and general store and platted the village. Wise Township that Loomis is located in, is named after George W. Wise. It’s another bone-chilling cold day in Michigan and my daughter is home from school. As soon as the decision is made to cancel school I get an email and a phone call on my camera phone. When I was a kid I remember having to listen to the radio waiting for the DJ to read off a list of schools. Back then they did not have computers to alphabetize the list so they would read them in the order the cancellations came in. Since I went to a school in the city it was one of the last schools to close. Most of the rural districts closed first so everytime they read the list I would have to wait until the end to see if my school was closed. ” dang it, it’s not closed yet” I guess I will have to listen to John Cougar’s Jack and Diane and then hopefully they will read the list again. I figure back in the olden days they went to school because they had no way of telling them not to. I hope you are safe and warm wherever you are at, and thank you for taking the time to read my posts.